Registration is now open for one of the very best Star Parties in our neighborhood (OK, a 3 hour drive. But well worth it once you’re there!). Aside from excellent dark skies (when it’s clear), a wide variety of day-and-night scopes for your observing pleasure, vendors and raffle prizes, and the daily lectures (for those not sleeping off the previous night), the Cherry Springs Star Party is a great place to hang with fellow amateur astronomers (Ryan and I spending the bulk of our down time with friends and fellow members of Kopernik Astronomical Society). The www.astrohbg.org/CSSP/ website is the official location for all announcements about the event, but we may provide updates here if something significant is announced (and will remind via facebook and twitter as well). If you’ve never committed yourself to a small block of time of heavy-duty nighttime observing, this is an ideal event and location to do so. And what better way to shop for your next scope than to have several hundred demos on display each night! Official email announcement is below. Registration PDF: 2014_Star_Party_Reg_Form.pdf. 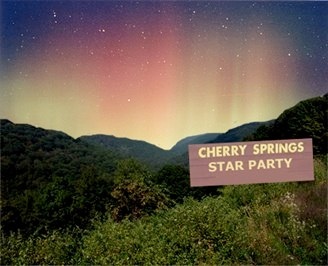 Mark your calendars now for this summer’s prime astronomy experience, the Cherry Springs Star Party in beautiful Potter County, PA. Make your plans now for a wonderful astronomy vacation under the darkest skies in the Northeast. Enjoy old and new astronomy friends. Families will enjoy the fun, too. Nearby Lyman Run State Park has a great lake and beach area for relaxing. They also provide shower facilities for those who are camping. Registration for this years star party is currently open. A registration form is attached to this email. Registration by PayPal is open and the link is included at the bottom of this email. You may send in your registration at any time. A Facebook page for this years star party has been created for up-to-date information regarding speakers, vendors, door prizes and weather updates. You do NOT need a Facebook account to access this page and the material on this page. The Facebook page will be updated periodically until the day of the star party. A update email will be sent out closer to the star party with a list of all the vendors, door prizes and other information that becomes available. Go to that link, on the left side, click Registration Information under the menu. That will take you to the page where you can register by PayPal. Central New York is fortunate to have several locations within reasonable driving distance for observing the Night Sky with, as Barlow Bob calls it, “attitude.” One of the best locations for both dedicated observing and meeting fellow amateur astronomers (and their equipment) is the annual Cherry Springs Star Party, held this year from June 6th to 9th. Cherry Springs State Park is just outside of Coudersport, a leisurely 3.5 hour drive to Northwestern Pennsylvania. Ryan Goodson and I (Damian) enjoyed two nights of great skies, an unbelievable assortment of factory and homemade scopes, several lectures on topics of astronomical interest, and a great weekend with members of the Kopernik Astronomical Society at the 2012 Star Party. Registration is now open for 2013! Details from the official announcement are provided below. The Registration PDF can be downloaded HERE. Registration for this years star party is currently open. A registration form is attached to this email. Currently, the website for the star party is being reconstructed, so PayPal registration as of this time is currently unavailable. We are working hard on the website and hope to have it up in operation shortly. Registration by mail is currently open. You may send in your registration at any time.